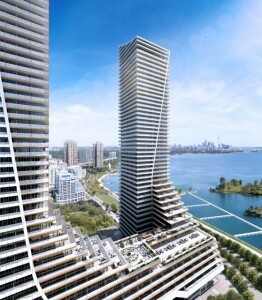 With Eau Du Soleil, you have one of Canada’s tallest and most iconic waterfront Toronto’s condominium communities. This is the latest architectural sensation from Empire Communities and it is going to redefine what it means to experience high-rise living. All while overlooking the beautiful waterfront neighborhood of Mimico. The towers rise 66 and 45 stories respectively, and they are ready to take their place in this established community known for its scenic lakefront parks and ample recreation facilities. The first of the two towers features 66 stories and has 750 units. The floorplans are widely varied, and range from one-bedroom to three-bedroom designs. The square footage can vary between 505 and 1,046 sq. ft. All suites have full-sized balconies complete with a barbecue, this can help safeguard the ‘outdoor living’ experience. All suites have ceilings of nine feet, save for the 60th floor and up, which have ceilings of 10 feet.